Seoul, Jan. 05, 2012 -– LG Electronics (LG) will showcase four new notebook models and an all-in-one PC at the Consumer Electronics Show (CES) 2012 in Las Vegas. LG’s brand new Super Ultrabook™ Series, the Z330 and the Z430, offer powerful performance and sleek design unseen in ordinary Ultrabooks, while the P535 and the A540 establish a new standard for 3D notebooks. Lastly, the V300 is the ideal 23-inch all-in-one PC for entertainment, thanks to its immersive 3D display and In-Plane Switching (IPS) -enabled wide viewing angle. The Z330 is the most compact product in LG’s newest Super Ultrabook™ Series, boasting vastly superior features above and beyond Intel’s Ultrabook™ requirements, while remaining attractive in both performance and portability. In terms of performance, LG’s proprietary Super Speed Boot technology enables rapid booting, roughly three times faster than other 13-inch notebooks in the market. Powered by the second generation Intel® CoreTM i7 processor, the Z330 requires less than 10 seconds to complete booting, while it requires a mere two seconds to recover from stand-by mode. Equally important, the Z330 is equipped with the latest SATA3 Solid State Drive (SSD) , which is more than 11 times faster than an ordinary hard drive. The Z330 is also unrivalled in terms of compactness and portability, thanks to its Super Compact Clutch design which reduces the width of the bezel to minimal levels. In turn, the Z330 exhibits a 13.3-inch HD display on a chassis whose size is equivalent to 12-inch notebooks. The Z330 boasts uniform slimness of 14.7mm throughout, not just at its thinnest edge. The Z330 is also extremely light, weighing a mere 1.21 kg, making it lighter than most competing Ultrabooks in this class. Such attractive dimensions and weight are surrounded by a metallic cover with a gyro-brush line finish, completing the Z330’s urban, chic look. The Z430 is a 14-inch notebook of the Super Ultrabook™ Series, which boasts powerful performance in a sleek, compact chassis. Powered by the Intel® Core i7 processor and equipped with SSD and HDD, the Z430 offers Super Speed Boot with 12 seconds booting time and arge storage capacity of up to 500GB. Such powerful features are packed into a superbly thin 19.9 mm thin chassis. The Z430 is the most compact 14-inch notebook available in the market, as its slim bezel enables the notebook to employ a 14-inch display panel in a chassis ordinarily used for 13-inch notebooks. 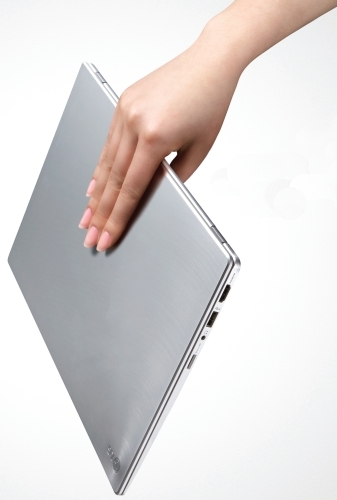 The 1.50 kg Super Ultrabook’s design is completed by its modern, chic exterior that combines a metallic cover with a gyro-brush line finish. A CINEMA 3D notebook designed to please style-conscious consumers looking for a comprehensive entertainment experience, the P535 builds on the sophisticated slim design philosophy of LG’s P-Series notebooks. The 15.6-inch super-slim LED backlight display contributes to the thinness of the P535’s 24.1mm chassis and its weight of 2.2 kg, making the P535 up to 24 percent slimmer and 27 percent lighter than the closest competing 15-inch 3D notebooks. Such a slim body allows the P535’s 15.6-inch display to be placed in a chassis normally reserved for 14-inch notebooks. The P535 is as powerful as it is stylish. Powered by the second generation Intel® Core™ i7 processor and NVIDIA’s latest GeForce GT 630M graphics card, the P535 boasts unbeatable performance, along with a wide display panel that exhibits superior CINEMA 3D capabilities. Powered by the second generation Intel® Core i7 processor with quad-core processors, the A540 offers consumers a full package of 3D entertainment through its glasses-free 3D display panel, the SRS premium sound effect and the 4.1 channel 3D sound. Thanks to its revolutionary CINEMA 3D display technology, movie fans can enjoy sharp, immersive 3D content on the A540’s 15.6-inch Full HD LED backlight display without eye fatigue. The NVIDIA® GT555M graphics card adds significant horsepower when watching HD movies, playing games or editing videos. The A540 comes with a 3D editing program that allows users to personalize their 3D images and videos. Initially unveiled in 2011 with the second generation Intel® CoreTM i7 processor, the V300 is LG’s first-ever all-in-one PC featuring Film Patterned Retarder (FPR) 3D technology and an IPS display. FPR technology enables the V300 to offer the most vivid, immersive full HD 3D viewing experience on a 23-inch Full HD display without any eye fatigue. Meanwhile, the employment of an IPS display significantly widens the viewing angle to 178 degrees and also allows users to enjoy multimedia content with superior picture quality. Unlike competing all-in-one PCs with a dual camera touch sensor, the V300 is equipped with a triple camera system that offers a superior multi-touch experience. 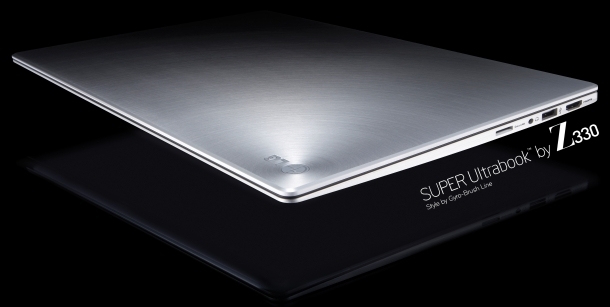 LG will be launching the Super Ultrabook™ Series and the new 3D notebook models worldwide during the first quarter of 2012.